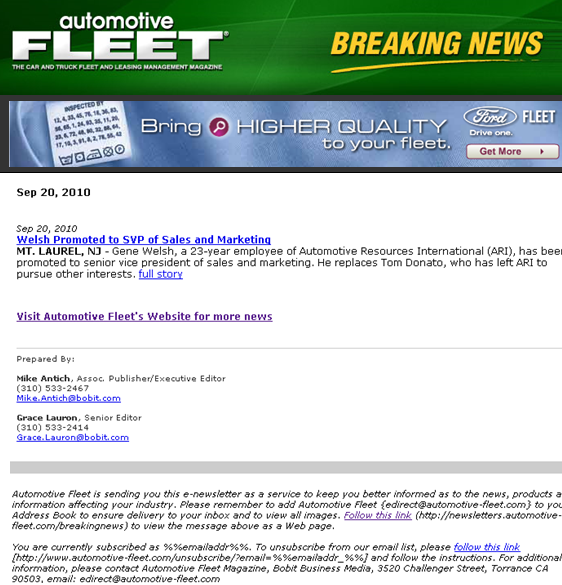 By advertising exclusively in all automotive-fleet.com Breaking News e-mails, you will be displayed prominently in front of decision-makers who are paying attention to the key developments in the industry. Whether we're announcing a major merger or high-profile acquisition – your banner will be what the reader sees first when he anxiously opens the e-mail. Watch your impression totals spike when these e-mails go out on average 2 to 4 times per month. COPYRIGHT © 2019 AUTOMOTIVE FLEET. ALL RIGHTS RESERVED.